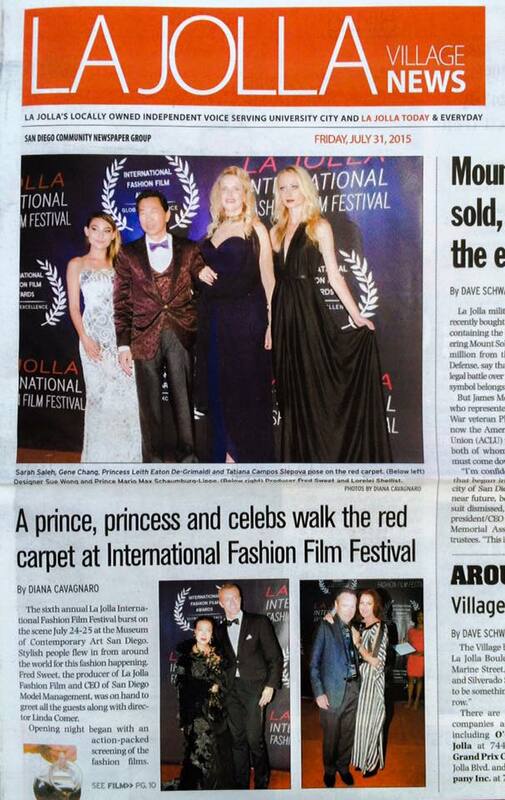 Prince Mario-Max Schaumburg-Lippe: Thank you my dear friends of La Jolla Fashion Film Festival for my selection as european tv-journalist, actor and entertainer to present the prestigious INTERNATIONAL LA JOLLA FASHION FILM AWARD FOR GLOBAL EXCELLENCE in the category BEST VISUAL EFFECTS together with genius design-icon and best dressed empress of fashion Sue Wong to the uber talented Adrien Servadio – Director! My dear colleagues of La Jolla Today, you are awesome, I put up picture of your article, we love it. Congratulations Adrien Servadio and our host my dear friend Fred Sweet and do not forget to visit http://www.ljfff.com/ to see all fabulous winners and secure your tickets for the next events early – they are a blast ! If you want to follow my personal life story, and dream come true and my column please visit AVANT GARDE Magazine of Michelle Long. — watching https://www.youtube.com/watch?v=EnZ2_sxmijw with Gene Chang and 2 others at La Jolla Village News.